Turkey. Perhaps I've painted myself in a cramped, colorless box, but isn't often when one receives an album from the crossroads of the world's influence. It is refreshing and educational in a sense for it shows my ignorance of the Turkish scene and thereby proceeds to curb-stomp me because of it. This is Death Metal purity of the most elite degree. Within are no gimmicks or hybrids, no scene kids, but only the effective permeation of classic standouts of forward-thinking and true Death Metal. Despite this being the band's debut full-length, I cannot accept any shade of my life without the band now being considered. This is high-quality, game-changing material. The album kicks off with "Revival" as it features some methodically massive chords lifted from CROWBAR and then de-tuned. When things get going, though, one is treated to some finely-executed grooves that are ahead of many of their Death Metal peers. Despite clocking in at 10:17 minutes, I was evidently so enthralled with the song that when the next song started after a very brief pause, I felt like I was a real-life victim of missing time. Perhaps the standout track of the album is the third track, "Visions of the Hereafter". The song explodes with a stirring tremolo-picked brutal riff portraying the Hereafter as a darkly frightening proposal. During the verse riff, the guitars blend into a cacophony-implying combination of ideas that are almost completely dissonant with just a shy gleam of hope for melody in its most liberal sense. This is the evolution of the sound of Death Metal I've always pined for: a pummeling sound with ample clarity yet still indicative of being much, much heavier than most other bands. The last full-band inclusive track is the fourth, "Phantasmagoric Transcendence". A simple technique that is so effective in Metal of this Ilk is what I call the "JUNH," the aggressively palm-muted delivery of a quick chord before an equally-quick silence produces the proceedings in full. The chord played properly actually sounds like "JUNH" so I'm sure anyone can apply this knowledge to their catalogues to search for other examples. As effective as it is, the technique cannot be really said to be wide-spread across Death Metal. This is a finely-crafted offering from purveyors of Death Metal that eclipses most others in its clenched-fist fury and innovative conception and delivery. In terms of guitar work, it must first be said that the tone utilized is perfect for Death Metal as it is brutal, cold, and precise. The chords are paralyzing as one is reminded firmly how the sound should sound. The riffs themselves, in addition to competing with more technically-driven bands, are promulgated by a deftly played bass. The bass is in every nook and cranny where the guitar is deficient, and in so doing, expands the sonic atmosphere. The drums are reverent to the genre, thankfully foregoing all the ridiculously-processed sound of others and still shining through on the mix. This guy is all over the place showcasing an arsenal of plenty toms and cymbals. What is frankly mind-baffling is that the band were silent for the last seven years since putting their last album out. Furthermore, this is technically the band's first full-length which is exceptionally shocking when considering the amount of rehearsal time alone it would take to put out an album of this quality in both delivery and concept. Any fan of Extreme Metal would do well to grab this record for it is a window of what is yet to transpire. 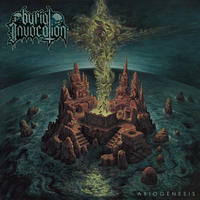 BURIAL INVOCATION is currently in the process of painting Death Metal's future. "Tenebrous Horizons," the outro track, chillingly shows the band stripped to acoustic, but horrifically-conceived as the melody sinks its teeth in. This is a strong release for this year and one that will be in many lists in the end.